I'm posting a little late as these items actually arrived yesterday. This week's deliveries include the gorgeous Brave 10 limited edition Blu-ray set from NIS America and the Japanese limited edition Blu-ray of the Zettai Karen Children OAV - which was the first press even though it was released back in 2010. I'm guessing it didn't sell very well, sadly. The limited edition of The Unlimited -Hyoubu Kyousuke- volume 6 completes the list of Blu-ray acquisitions. 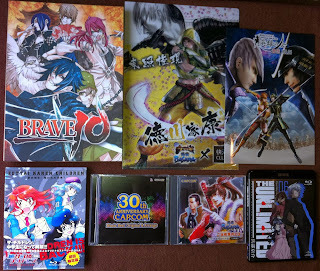 The two CDs are 30th Anniversary Capcom Music Best: Original & Arrange and Sengoku Basara: Burari, Bushou Futaritabi ~Kyouto-hen~. I also received a free Sharrkan (Magi) keychain from Yesasia which I forgot to include in the photograph. In the top right corner is the fourth and final newsletter from the old Sengoku Basara Eiyuu No Kai fan club and next to it is my free gift of a Ieyasu/Mitsunari clear file from the Basara shop. The previous note about the last batch being my final doujinshi purchases until winter Comiket was a lie too, as I seem to have acquired a few more somehow. Hey RD, I'm dying to know...in the Sengoku Basara: Burari, Bushou Futaritabi ~Kyouto-hen~ CD, do the seiyuu act as their characters or is it more of a radio talk CD? Do you also happen to know how the previous navi CDs were in the same regard? Thanks! Hello! The old travel navi CDs are mostly narrated out of character with a few segments for performing lines from the series, and they feel like a radio variety show to me. The newer Burari, Bushou Futaritabi ~Kyouto-hen~ CD has a different format but it's still mostly out of character, and it's really silly like the radio shows that Morikawa/Morita used to run (even down to the return of gags about Toyotomi strategist Takenoko Hamburg ^^;). They go to a bunch of shrines and temples and eat local sweets together, occasionally making reference to their characters or (in one track) reciting lines from the games. It's also worth noting that the new one has a solid 76 minutes of talk, so it's pretty good value. Yukimura's was really short in the old series. Ah, thank you! I've always wondered about these. I really wish they'd do more in-character but out of context/outside major storyline CDs. I absolutely love the ones that come with the Basara Magazines!